Experience the fantastic scenery of the Canadian Rockies and the Coastal Mountains visiting the Okanagan Valley, Glacier National Park, Banff & Jasper National Parks which are teeming with a spectacular array of flora and fauna. Collect your car from Vancouver Airport and drive to your hotel. 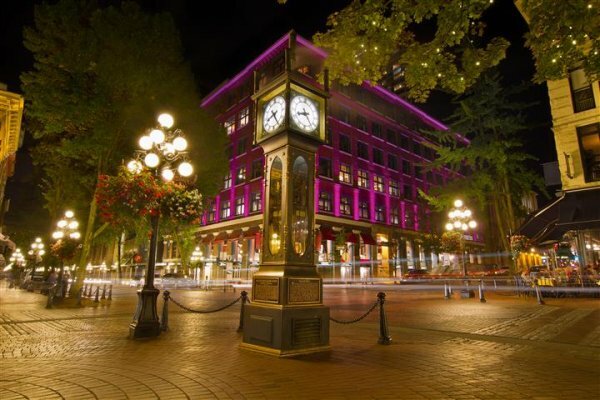 Enjoy a full day in Vancouver. Enjoy the â€œSan Francisco-styleâ€ Vancouver city trolley tour and explore at your own pace as you hop-on and hop-off at many premier attractions, parks, gardens, galleries and restaurants. 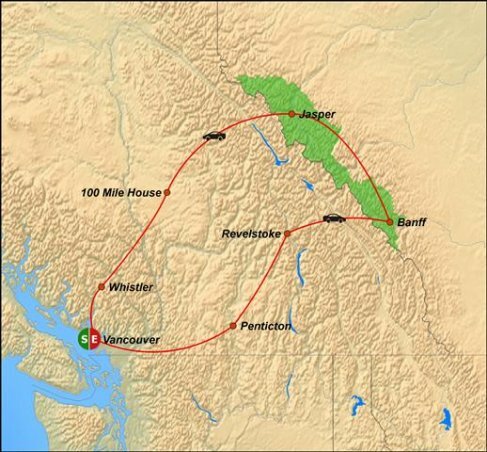 Today travel through the Coastal Mountains and Manning Provincial Park. Drive past spectacular waterfalls, towering peaks and beautiful lakes en route to the Revelstoke area. Your drive today will take you through Glacier National Park en route to Banff. Explore Banff and the surrounding area at leisure. Escape into the Canadian Rockies for a 2-hour trail ride. Follow the Bow River and traverse the side of Sulphur Mountain. This excursion is suitable for novice to experienced rider. 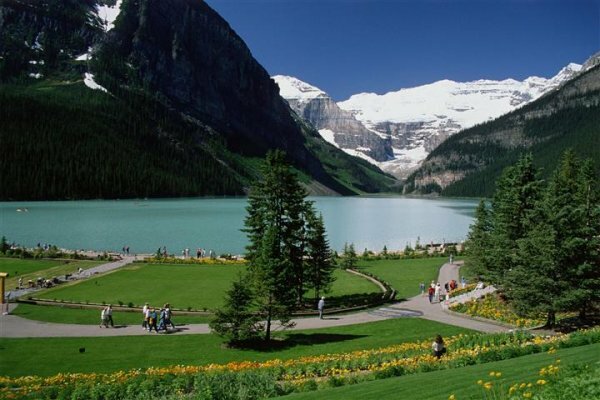 Today you will drive to Jasper via the spectacular Icefields Parkway and Peyto Lake. Try an Ice Explorer ride on the Columbia Icefield. Enjoy a full day at leisure exploring Jasper and the surrounding area. Take a 90-minute cruise on one of the Rockies\' most picturesque lakes. The tour is operated in a glass-enclosed, heated cruise boat and is fully narrated. Mid-way through there is a photo stop at Spirit Island where you can disembark for a short walk to the lookout point. 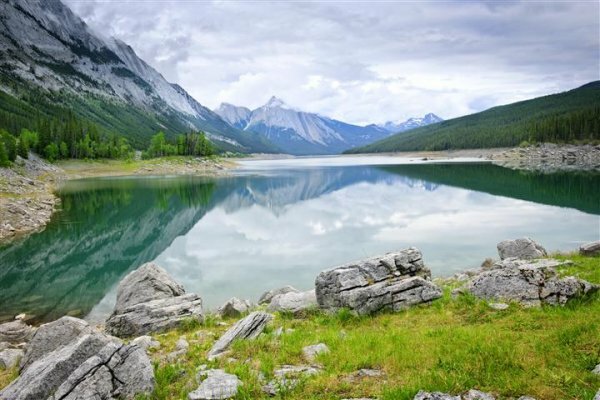 Explore the Maligne Valley and discover striking natural beauty, abundant wildlife and a genuine geological mystery. Youâ€™ll visit the longest natural lake in the Canadian Rockies, view a spectacular 50-metre gorge created by 10,000 years of erosion and travel to â€œdisappearingâ€ Medicine Lake, the source of what is believed to be the largest underground river system in Canada. Drive through the Yellowhead Pass and continue south along the Thompson River to your next destination. Overnight in 100 Mile House. Today you will travel to the edge of Garibaldi Provincial Park and the popular year-round resort of Whistler. Overnight in Whistler. Enjoy a full day at leisure exploring Whistler and the surrounding area. This morning take the scenic two-hour drive to Vancouver. The remainder of the day is at leisure. Tour ends. Drop off your hire car and check-in at Vancouver International Airport for your departure flight. For full details on prices and inclusions visit our web site. All self-drive itineraries can be adapted to suit your individual requirements â€“ please contact us for a quotation. Vancouver - Hop on / Hop off Trolley Tour (Day 2). Airport transfers, taxes and Insurance. Meals and attractions unless otherwise specified.